LIC Jeevan Labh Plan is a new limited premium endowment plan. This Jeevan Labh LIC Plan 836 is perfect for planning child’s education and marriage. Because the LIC’s Jeevan Labh is a combination of investment and insurance. Any people whose age is between 8 to 52 years can take this new endowment policy. But to know the LIC Jeevan Labh Policy details, you should read the complete article. 1.7 What is the Claim Procedure for LIC Policy Jeevan Labh? The Jeevan Labh LIC Policy is an Endowment Insurance plan released by Life Insurance Corporation of India. The LIC Jeevan Labh Plan 836 will be working from 4th January 2015. The Unique Identification Number for LIC new Jeevan Labh Plan is 512N304V1. LIC’s Jeevan Labh Endowment Plan is a participating limited premium paying, non-linked, with-profit endowment Insurance Plan. New LIC Jeevan Labh Plan is a comprehensive endowment plan that ensures a financially secure and guarantees your peace of mind. The New Jeevan Labh plan provides financial aid for the family of the deceased policyholder any time before maturity. The main feature of Jeevan Labh plan is it has the limited premium payment option. For the 16-year policy term, the buyer has to pay the premium for 10 years. Whereas for 21 and 25 years of the policy term, the policyholder have to pay the premium for 15 and 16 years respectively. You can get the detailed information regarding the LIC Jeevan Labh Plan in the following sections of this page. LIC Jeevan Labh Plan Death Benefit = Sum Assured on death + Vested Simple Reversionary Bonuses + Final Additional Bouns(FAB). Sum Assured on Death: On the death of the policyholder during the policy term, Sum Assured on death, Vested Simple Reversionary Bonuses, and Final Additional Bouns will be paid. Sum Assured on Death is 10 times higher than the annualized premium. Death Benefit: The Death Benefit shall not be less than 105% of the total premium paid as on death. Maturity Benefit of LIC Jeevan Labh Plan = Sum Assured on Maturity + Vested Simple Reversionary Bonuses + Final Additional Bouns(FAB). Sum Assumed on Maturity: On Survival to the end of the policy term, Sum Assumed on Maturity, Vested Simple Reversionary Bonuses, and Final Additional Bouns will be paid. The above table provides brief details regarding the Jeevan Labh LIC plan. The buyers who are willing to buy LIC Jeevan Labh plan should know the eligibility criteria. Therefore these details are very useful to know the entry age, coverage term, monthly income, and other details of Jeevan Labh Plan. Here, you can also find the Jeevan Labh Premium Chart. Using this, you can get an idea about the premium about as per the term of the policy. Required documents to buy for LIC Jeevan Labh Plan is mentioned below. Revised Proposal Form No. 300, 340 and 360. Proposal Form along with the photo. With the aid of the following above documents, you may contact nearest LIC branch to buy a new LIC Jeevan Labh Plan. What is the Claim Procedure for LIC Policy Jeevan Labh? While lodging the claim in case of death of the Life Assured following documents is needed for claim procedure of LIC Policy Jeevan Labh were given below. Participation in Profit: New Lic Jeevan Labh policy intended to participate in profits of the Corporation and entitled to receive Simple Reversionary Bonuses. 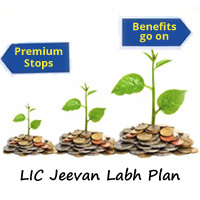 Riders: Riders are available under this LIC Jeevan Labh Plan. Availability of Accidental Death and Disability Benefit Rider and New Term Assurance Rider. LIC’s Accidental Death and Disability Benefit Rider UIN (512B209V01): Lic Accidental Death and Disability Benefit Rider (AD&DB) is available as an optional rider. Paid-Up Value: After at least three full year’s premium have been paid, and any succeeding premiums are not duly paid, Jeevan Labh LIC Plan shall not be wholly void, but shall subsist as a paid-up policy. Surrender Value: The insured can surrender the policy at any time during the policy term provided the insured have paid at least three full years premiums. Revivals: If the policy has expired, then the Life Assured can revive the same during his/ her lifetime. Loan: Loan facility is available under LIC Jeevan Labh 836 plan, after payment of premiums for at least three full years. Free Look Period: If Customer is not satisfied with the “Terms & Conditions” of the LIC Jeevan Labh Plan, he/she may return the policy to the Corporation stating the reasons for objections, within 15 days from the receipt date of the policy. If the policyholder commits suicide for any of the reasons within 12 months of the date of commencement of risk or from the time of revival, then the corporation will return 80% of the premium for what he had paid to his assignees or nominees. Tthe actual prem. of table no.836 without S.T. table & term wise. Please make a new plan for 21 years in favour of the children. Otherwise like as jeevan tarang. Or jeevan Kishore or jeevan chhaya . Thanks of the lic of India. It’s my opinion. I am 24 years old having salary income Rs.500000/- and wish to purchase Jeevan Labh policy sum assured Rs.25,00,000/- under term & table 836-25(16). Let me know the medical requirements.